Senators have dumped embattled Senator Dino Melaye, who is to spend the next 38 days at the Police Medical Centre in Lokoja, Kogi State. Unlike when he was arraigned at an Abuja High Court over false information, which saw no fewer than 11 senators accompanying him to court, none of his colleagues was present on Thursday at his arraignment before a Magistrate Court in Lokoja, the Kogi State capital. Even some of his close friends among the senators such as Isa Misau, Peter Nwaoboshi and Abdullahi Sabi were not on ground at the Lokoja Magistrate Court. Our correspondent gathered that some senators who are close to Melaye may have decided to retreat so that anti-graft and security agencies will not come after them. Already, the Economic and Financial Crimes Commission has started the scrutinisation of the accounts of some senators as earlier reported by Ujuayalogu'sblog. They thus see solidarity at this time with Melaye as capable of triggering such scrutiny. The Eagle Online reliably gathered that Melaye’s lawyers will challenge the ruling of Magistrate Court on Friday (today). The embattled senator’s lawyers are expected to file a fundamental rights enforcement suit at the Federal High Court, Lokoja on Friday morning. 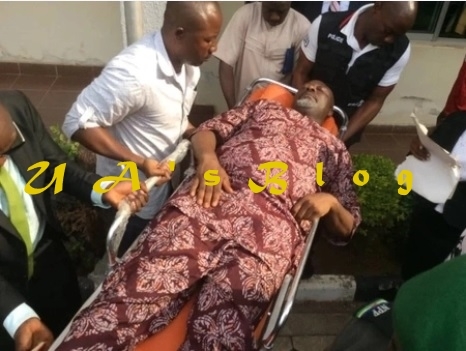 Melaye was brought to the Lokoja courtroom in an ambulance around 9am on Thursday.